One of the things I’ve strived for when it comes to grocery shopping is anonymity. I am most comfortable impulse buying fattening, sugary foods while strolling among strangers. All I care about is getting my two main men, Ben & Jerry, safely home to my freezer, where they can hang out until the end of a rough day. And then came my son, Deacon, and Vons’ blasted car carts. For those who have been sheltered from these car carts, whether it’s because you shop at Sprouts or after 8 p.m. on weeknights, allow me to paint a vivid picture. Car carts are shopping carts that have been outfitted to look like little cars to entertain kids while parents shop. Hulky and barely manageable, they come in several colors, including hot pink, black – a police car so you can pretend to arrest the other lady buying Ben & Jerry’s! – and yellow, and feature black steering wheels to help kids pretend they’re driving down Fletcher Parkway rather than suffering through Mommy’s boring shopping list. And while it seems like a great idea, these car carts make victimized parents the bane of their fellow shoppers’ existence. I’m convinced Deacon is clairvoyant because he knows exactly where these car carts are stowed around the parking lot. He starts to make his now familiar “Ah-heh! Ah-heh!” sound almost immediately after I pull him out of our vehicle. I know exactly where he’s pointing: It’s to a car cart. Pushing these car carts down grocery store aisles is a lot like towing a semi-truck down a zipper lane. No one likes you when you’re behind the car cart. You’re blocking their access to garlic pickles, Krusteaz buttermilk pancake mix, or – heaven forbid – that super special can of soup that reminds them of their dear ol’ Meemaw. 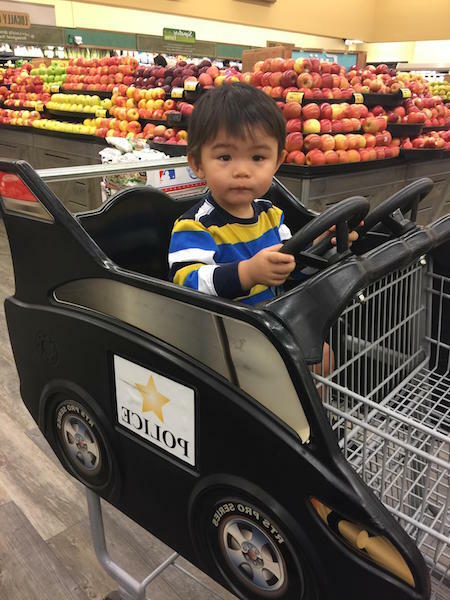 In addition to being a human obstacle to all things good at the grocery store, you’re also pushing around a child who now has all kinds of access to whatever is on the shelf next to him. If you have any manners, you will endeavor to make way for other shoppers by getting as close as you can to one side of the aisle. Unfortunately, that also means Junior is as close to the side of the aisle as well. Thanks to these car carts, there’s no longer disinterest or indifference when it comes to me at a grocery store. Now I am on the receiving end of pity, sympathy, stifled laughter and, worse than anything else, curiosity. So here’s my plea to Vons shoppers in La Mesa: If you have the misfortune to be shopping on a Sunday afternoon with me and my family, kindly ignore us as we navigate the aisles with a monster car cart. Don’t judge me as I plead with Deacon to please give Mommy a break. And whatever you do, don’t look in my cart. —Genevieve Suzuki is a La Mesa resident who practices family law. Visit her website at sdlawyersuzuki.com.